Ben has been working on a geometry main lesson block since the start of our school year. We are using Barbara Dewey's book for sixth graders. Ben is enjoying it thoroughly and I thought I would post some photos of his work. I hope to have all the drawings up in an album soon. Sorry some of the following drawings are light and difficult to see but they are all done in regular pencil (unless colored). 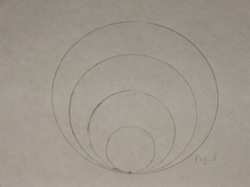 Compass work, creating circles with circumferences 1" in size different from the last with the same center. 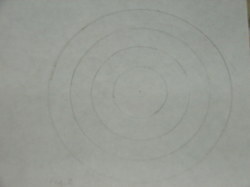 This drawing was made by creating a center circle and stepping around the circumference with equal sized circles. 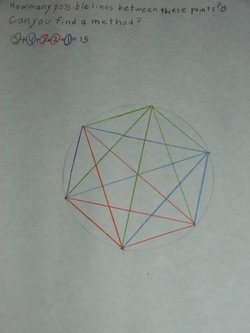 Then the star area was colored with colored pencils. 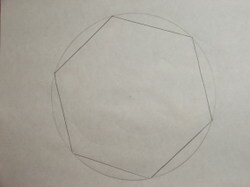 Creating a perfect hexagon is done by stepping around the circumference of the circle with the compass and joining the points with a ruler. 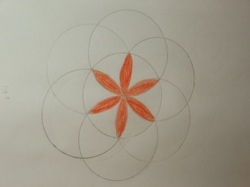 ...and to divide the circle into six equal parts. Lastly, he determined the number of times the points along the circumference could connect mathematically and color coded the equation. 5 + 4 + 3 + 2 + 1 = 15. 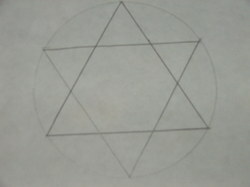 He also noticed that this drawing was a combination of the previous three: the hexagon, the six pointed star and the circle divided into an equal pie. 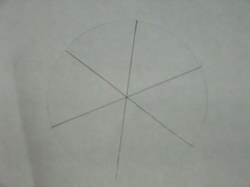 Ben has learned how to use a compass, ruler and several definitions (radius, circumference, etc.) thus far in our study of geometry. We are really enjoying doing it together. Our backyard becomes a skating rink this time of year. There is no ice to be seen but the ground is covered with thousands of acorns, making walking very difficult and slippery. 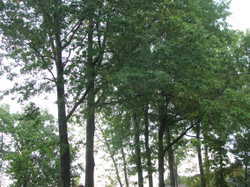 We have a number of pin oak trees on our property. All of them are very tall and laden with nuts. It is rumored that many acorns mean a cold and snowy winter. If that is the case, we are in for a rough one! Rather than let all the squirrels grow fat on the acorns, we have decided to put them to good use. Our family is studying Botany together this year. While there are various books we are using, My Side of the Mountain by Jean Craighead George is full of ideas for identifying edible plants and general wilderness survival. The kids and I are using it as a read aloud this fall and plan to try some of Sam Gribley's excellent culinary ideas. :) First on the menu are acorn pancakes! They are mentioned in the first chapter of the book. If you scroll part way down this page, you will see directions for baking acorns and how to prepare the flour. There are many recipes to be found here. 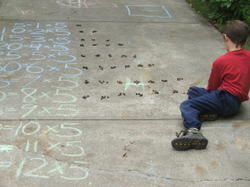 Christopher has also put the acorns to good use for math manipulatives. While the weather is still warm, we are doing most of our lessons outside. Here he is working on his 5x table. I will try to post photos (and reviews :) of the acorn pancakes later in the week.